”In JURASSIC PARK, adapted from Michael Crichton’s 1990 best-seller, the dinosaurs — some benign, some terrifying, all wondrous — tap into the giddiest science-class daydreams you had as a kid. Created through a blend of computer-generated animation and electronically controlled models, they are so marvelous, and Spielberg choreographs their scenes with such wit, tension, and verve… [JURASSIC PARK] has enough of [Spielberg’s] innocent, playful virtuosity to send you out of the theater grinning with delight. “As rays of blinding white light — Spielbergian light — poke through a dark forest, something large and ominous is crashing through the trees. Is it a dinosaur? No, just a bulldozer. From the opening moments of Jurassic Park, Spielberg toys with our expectations. Before long, we’re off to the desert, where Grant and his paleobotanist girlfriend, Ellie Sattler (Laura Dern), are; digging up fossils. Under the glaring sun, Grant dispels the myth that all dinosaurs were pea-brained. He tells an ominous story about the vicious, cunning velociraptors (”raptors” for short), who would work as a team to outwit their prey. His tale evokes an early scene in Hollywood’s first great giant-monster fable, the 1933 King Kong, and from that moment on the audience is hooked. Spielberg is so good at setting up the wonders to come that he leaves us just about dizzy with anticipation. “Returning to his trailer, Grant stumbles upon a mysterious visitor, John Hammond (Sir Richard Attenborough), a billionaire Scottish developer who has created an extraordinary new amusement park on a tropical island just off Costa Rica. The main feature? Real live dinosaurs, cloned from strands of fossilized DNA. Hammond needs scientific approval of his project to satisfy his investors, so he offers Alan and Ellie a tour of Jurassic Park. Arriving by helicopter at the lush, mountainous island, they are joined by a mercenary lawyer (Martin Ferrero) who represents Hammond’s investors and by Ian Malcolm (Jeff Goldblum), a black-clad mathematician who keeps jabbering on about the perils of tampering with nature. The film wisely treats this old-hat science-fiction theme as a quasi-joke, with Goldblum throwing away his lines in a jittery deadpan. “The characters are sent out on little rail cars to view the creatures of Jurassic Park, which are kept behind electrified fences. 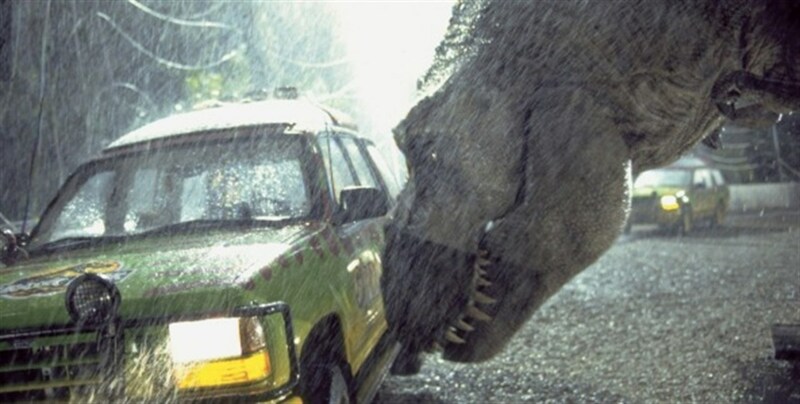 Then a thunderstorm strikes, the power goes dead, and the cars stall-right in front of the T. rex paddock. As in Jaws, Spielberg gets you exhilarated at your own anxiety. With its tiny claws and big, bulgy body poised atop birdlike legs, the T. rex is a comically awkward-looking creature, yet it moves with a frightening horizontal thrust. Smashing its huge jaws down on one of the cars (with Hammond’s two grandchildren pinned screaming under a piece of glass), it is so ruthless yet so dumb — a primordial killing machine — that you want to giggle and duck for cover at the same time. Spielberg orchestrates the action with an escalating sense of play. The scene is pure enchantment: scary, majestic, and, at its chomping climax, horrifyingly funny.